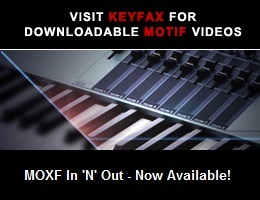 Finally, a major new video on recording and music production on the Motif platform! This feature-length video, co-hosted by Phil “Bad_Mister” Clendennin, looks at all the twists and turns of music production. The video trailer below contains pre-release ‘deals’ now no longer in play but also gives you a sneak preview into the video content. New ‘bundle’ deals are available. Please check the Shop here at Motifator.com for latest details. Sections and topics include file management, understanding different recording concepts (MIDI versus Audio, monitoring, how best to prepare for recording), Pattern recording, using arpeggios, recording Songs, how MIDI becomes audio, using effects and much more. Additionally, the video looks at how to connect Motif to and interact with the leading DAW platforms.